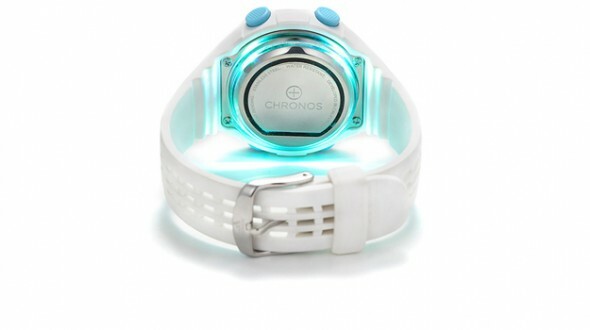 Chronos Makes Your Dumb Watch A Little Smarter | OhGizmo! By Assad Rahm Alli on 11/10/15 • Leave a comment! You may have spent a bunch of cash on your nice new watch, but you’re starting to look at all these people walking around with smart watches and it leaves a sour taste in your mouth? Well, you can have your cake and eat at least part of it too. The Chronos… disc(?) attaches to the underside of most watches and gives them a fair bit of smartwatch functionality. Working with an app on your phone, it counts steps and monitors heart rate like a FitBit, but also allows you to program a variety of vibration and light combinations for alerts. As with the Apple Watch, you can prioritize certain contacts and alerts over others, allowing them to come through while ignoring others for the time being. The disc also senses taps on the watch face to trigger user-specified functions like skipping a call or taking a photo. Sure, 33mm across and 3mm deep disc won’t give you a fancy touch interface, and it’s lacking some of the features of the Apple Watches and the Moto 360, but it’s a compromise, and not a super expensive one either. A $99 pre-order gets you one, with shipping in spring 2016.